This is SKYRACK 42, published amongst the debris of a home-town convention on 27th April 1962 by Rons Ellik and Bennett at 13 West Cliffe Grove, Harrogate, Yorkshire, England. 6d. per copy. 2/6d for 6 issues. 35 cents for 6 issues in USA (6 issues sent airmail for 65 or 4/6d) where subscriptions should be sent to Bob Pavlat, 6001-43rd Avenue, Hyattsville, Md. News of interest to sf fans is always welcome. Heading and cartoon by Arthur Thomson. Soggy by Terry Jeeves. New subscribers please note that the size of this issue is unusually large! DEECEE IN 63 & LONDON IN SIXTY-FIVE! PETERBOROUGH SWEEPS IN!! Forty-five members already registered! 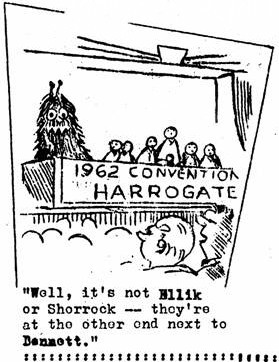 The 1962 National British Convention was held in Harrogate from Good Friday, 20th April to Easter Monday, 23rd April. The actual programme was split between the West Park and Clarendon hotels, situated on the edge of the famous Harrogate Stray. It would probably not have mattered if they had been situated two miles underground, however, for the spa’s beauty was viewed only through rain coloured spectacles for the greater part of the weekend. London’s well-publicised bid for the 1963 con-site was swept aside when Ken Slater and Dave Barber announced that they were putting in a bid for Peterborough next year. It is a long time since Britain had two groups fighting for a consite and the position surely reflects the enthusiasm in British fandom today and also the excellent work of the BSFA in recruiting new blood; many new faces were in evidence during the weekend. It was a Committee policy to try and give value for money and probably the most expensive prize-range ever was distributed at the convention. As such, it is possible that the con will lose money. With several bills still to pay there is a small profit, but we are anticipating an unexpected bill from one hotel. Actual attendance, notwithstanding gatecrashers from the nobility and elsewhere, was 94 out of a 105 membership. THE CONVENTION BEGAN for me, writes Ron Bennett, Wednesday, 18th April when the first delegation rolled in. At 8.15 an entire block of flats in which I live was roused by the arrival of the German contingent. consisting of Tom Schluck, Rolf Gindorf, Wolfgang Thadewald, Thea Grade, Horst Margeit and driver Guntram Ohmacht. We had a whale of a time during those two pre-con days, driving out into the Yorkshire dales and visiting the limestone karst country at Malham, source of the River Aire. We climbed the 200’ high Gordale Scar and walked mountain roads while Guntram waltzed merrily backward down a one in six gradient trying to take a picture. It was one of those idyllic days in one’s life and a wonderful example of international friendliness.The six Gerfans stayed over in Harrogate until the Tuesday (as did Al Hoch) when Wolfgang celebrated his 24th birthday. THE HOTEL LOBBIES were soon crowded out on Good Friday and the programme began in the evening when Ron Bennett, introduced various celebrities in the traditional manner. General merry making continued until 3am when the floating card school left the Clarendon where manager Brian Little had tried hard to lose the hotel to Brian Ball and Norman Shorrock. THE SATURDAY PROGRAMME began with a playing of a tape recorded by the BBC and belonging to Brian Aldiss of the Home Service programme THE REALM OF PERHAPS, a discussion on sf by Ted Carnell, John Wyndham, Brian Aldiss, Ken Bulmer and others. Following the tape long standing Nova writer E.R. James surveyed the sf scene, defining sf as having a basis of scientific fact explained logically. He claimed that Yoga thought of the concepts of science fiction long before sf did so. James amazed his audience by removing his jacket and standing on his head Yoga fashion. He spoke of the claims of Yoga and the manner in which Analog was using stories based on the off-beat sciences, and mentioned how to work even slight scientific concepts into stories. He wound up by reviewing his own sf history and the trends of sf during the last ten years. One major theme, he said, is that of overcrowding and survival. As gets older one writes better, said James. One has a better insight into human nature and this is all important to writing. A short discussion followed, mainly on Yoga. Harry Harrison refuted the claims of the Eastern mystics, following research by Koestler and Liverpool OMPAn John Roles defended James. BRIAN ALDISS introduced TOM BOARDMAN, the Guest of Honour, mentioning man’s first efforts at writing which were possibly on the lines of “mastodons crossing” or “back in ten minutes, lunch in caldron.”. The first book was possibly religious (like sf?) and written in cuniform on baked clay tablets. This would hve been difficult to interpret, rather like a fanzine. He spoke of progress made in publishing. Last year there were over 100 sf titles with much old reprint material because there is today a shortage of good SF writers in an age when there are great opportunities for writers who can think for themselves. SF, said Aldiss, is more than ever in the public eye. Only recently there was the Question in the House of Commons on Skyrack and Prime Minister Harold Macmillan. Actual examples, said Aldiss, included a coverage by “Vogue” and the BBC's "Realm of Perhaps.” John Wyndham is selling regularly on the general market and sales for “The Day of The Triffids” is rivalling that of Agatha Christie. For years we have had to fight for a general acceptance of sf and now this has arrived. This year we had the first pocket books which had covers without the eternal bug eyed monsters chasing glamour girls. These are the Mayflower Sci-Fi series which have as their editor Tom Boardman. TOM BOARDMAN, The Convention’s Guest Of Honour, told his audience that surprised though they might be to discover it, publishers are trying to make money. Publishing is their living. He asked why hardcover publishers sold only two thousand copies of a book and yet would repeat the experiment, and answered his question by stating that often they are hoping to sell subsidiary film or reprint rights. Subsidiary rights are very important in the publishing world, said Boardman. He spoke of the rivalry to publish only good sf, though this itself is a danger, he said, to publishers. If more publishers jumped on the bandwagon the cake would be split more ways for buyers such as chain libraries would spread their orders and there would be less cash per publisher. One solution for a publisher appeared to be the paper back field. SF appeared to be a cast iron bet as a steady seller with usually fifteen to twenty thousand copies sold. How different from books like Ted Tubb’s “Alien Dust” in the hardcover edition which sold only. one thousand. He spoke of his own experiences in editing paper backed SF, mentioning Penguin, Corgi, Panther and finally Mayflower. After his talk Boardman was asked questions on reprints under different titles, many members of the audience accusing publishers generally of underhand dealings and quoting examples. Boardman spoke of several different legitimate reasons for this common practice and also answered questions on the selection of material and commissioning writers to work to specifications. Altogether a most interesting and. entertaining talk. THERE WERE TWO AUCTIONS conducted by Ken Slater, one Saturday and one on Sunday. These ran well beyond the allotted time in each instance. On the Saturday it was probably a good thing for the intention had been to allow attendees time to sightsee around the spa but it rained, oh my how it rained! On the Sunday afternoon the programme had to be hurriedly reorganised and the TAFF talk by Ron Ellik ws put back until the evening prior to the film show. The two auctions together realised a record sum of £39 11s 9d, 50% of which went to TAFF. THE FANCY DRESS PARTY on the Saturday evening, was extremely ably compered by Cheltenham’s Eric Jones, supported by music from the specially imported Gerry Poole Trio. With the theme of the fancy dress A.D. 2062 prizes were won by Sector General Nurse Ethel Lindsay, Traffic Warden Wally Johnson, Angel Jill Adams, Mutant Tony Walsh and Hobbit and Strider Ken Cheslin and Susan Slater. Phil Rogers ran a book on a horse racing game which raised hopes of backers and fifteen shillings for the convention and Ron Bennett sidestepped a conga line which spread into the hotel’s public bars to down the first glass of sulphur water - rigged of course (I live here) - in the spa-water drinking contest. Contestents were John Roles, Brian Jordan and Horst Margeit. Roles quickly retired and Jordan finally won. It is understood that when he recovers he will inform us as to the quantity drunk. The publisher of SKYRACK apologies for the lengthy gap between issues 41 and 42 and says that he is now recovering nicely from his nervous breakdown. AT THE BSFA’S ANNUAL GENERAL MEETING Ella Parker bid for the 1963 Convention on behalf of London and Ken Slater spoke on behalf of Peterborough. It was suggested that the issue be left until the afternoon when the vote would be taken. Discussion on the point took place informally at lunchtime and after the Professional Panel the vote was taken, the return being Peterborough 39, and London 23. It was generally agreed that poor presentation of a worthwhile scheme for a prestige hotel swung the favour to the Peterborough backers. THE BSFA’S NEW OFFICERS took over at the AGM with Terry Jeeves stepping up to take over as Chairman for the coming year. Bobbie Gray was elected Vice-Chairman and Jill Adams took over as Treasurer from Ted Forsyth. Ken Cheslin was elected Secretary and Jimmy Groves relinquished the post of Publications Officer to Michael Rosenblum and Ella.Parker, two experienced publishers who will have the job of putting out VECTOR, and the BSFA NEWSLETTER. Peter Mabey continued as Librarian and reported in detail of the Library’s standing saying that it is now the largest SF lending library in the world. THE DR ARTHUR R. WEIR MEMORIAL FUND was discussed and it was agreed that the money collected during the past year, some fourteen pounds, should be devoted to a Fan Recognition Award in Doc’s name. A British Fantasy Award was also discussed and Tom Boardman offered to publish an anthology to raise funds for this award, on the lines of a similar anthology project already in operation for the mystery writers under his wing. MICHAEL ROSENBLUM gave what was generally agreed to be the most interesting talk of the weekend with informal reflections over the past 25 years. He read from Speer’s original Fancyclopedia and spoke of the days when the Clayton Astounding was brought to this country as ballast and could be bought for 3d or 4d a copy. He mentioned Hornig’s club for letter hacks and Douglas Mayer’s formation of the first foreign chapter of the SFL in Leeds. Other chapters were formed and eventually the first British convention was held in January 1937. Michael distributed photosheets (originally published in The New Futurian) which showed attendees to include Eric Frank Russell, Arthur Clarke, Walter Gillings and Ted Carnell. He spoke of the beginnings of New Worlds and the disintegration of British fandom within a fortnight when war broke out in 1939. Fanzines at that time included Liverpool’s Satellite and Gargoyle, he said, and his own Futurian which was later combined with Ron Holmes’ Science Fantasy War Digest to become the Futurian War Digest. Michael spoke of the formation of the British Fantasy Society, originally a temporary war oranisation, and his own virtual gafiation until 1953 when a new Leeds group (LSFA) was formed. He was asked questions about the wherabouts of various fans of the last twenty years and also how present day fandom compared with that of 25 years ago. Michael said that both fandoms appeared to contain their thinkers, but whereas the fandom of yesteryear worried about the wrongs of the world and thought that perhaps it could put them right, fandom today worried just as much but was more inclined to live for the joys of the hour. The talk had to be terminated because of the lack of time available. THE PROFESSIONAL AUTHORS PANEL was made up of Harry Harrison, Brian Aldiss, Ernest James, James White and Stephen Hall, with Tom Boardnan lending moral support to the jug of water that was passed amongst them. They spoke about where they get their ideas and agreed that it wasn’t a case of getting ideas but stopping the ideas from coming and in short a case of discrimination. They gave examples, spoke of favourite plots, of what they admired in each other’s writings and of the state of sf today. A MATTER OF LIFE AND DEATH was the film shown on the Sunday evening. Perhaps this is not strictly sf but it was agreed to be an entertaining and worthwhile film. Other entertaining shorts were shown at a wine and cheese party thrown in the Clarendon display room by Norman Shorrock and Sid Birchby. A great time was had by all, quipping at ancient Tarzan silents and shooting the hero with blanks. A table collapsed under combined viewing weight and Brian Aldiss and Harry Harrison cooked meat pies over a waste-basket fire. The hotel managements were as friendly and as co-operative as any we've ever had and West Park owner Bert Harman and Clarendon manager Brian Little entered into the con spirit and were soon on first name terms with many attendees. THE PROGRAMME BOOKLET was a superlative affair and was once again ably produced by Norman Shorrock and Eddie Jones. Many thanks, you Liverpudlians, and thanks too to all who helped make the con a social success - Ken Slater for his handling of professional advertisers and the auctions, Phil Rogers for his programme planning, Eric Jones for his work on the fancy dress party, Brian Jordan and Chris Miller for their fan and photographic displays, Terry Jeeves for his collecting of auction material and especially to Jill Adams for her work on the registration desk and to Jhim Linwood and his willing hand of supporters for the work involved in moving chairs and facilitating seating. “the sort of chap who thinks Lovccraft is a book on marriage technique! (Sid Birchby)...”the first time the hotel has not been opposite a church and you deserve the no bell prize” (Archie Mercer)...”neither one of us knew what ws were talking about but I was louder” (Ron Ellik). BRIAN JORDAN (86 Piccadilly Road, Burnley, Lancs) would like to be included on the lists of anyone circulating for sale photos taken at the con. CON ATTENDING GERFANS were guests at a bumper BSFA open night at the Parker Pen 27th April. Ted Forsyth reports that Arthur Thomson highlighted the evening with explanations of unprintable puns. Said Gcrfans will attend their con as early as next August - tte 24th at Unterwossen, Bavaria. 21 fans voted in the poll, as against 22 last year. Whilst this number might at first sight be thought to be hardly indicative of the numerical state of fandom today, I think that it can be said that the poll itself reflects a truly representative cross section. The twenty-one Good People were: Gill Adams, Ron Bennett, Eric Bentcliffe, Sid Birchby, Bruce Burn, Buck Coulson, Bill Donaho, Colin Freeman, Keith Freeman, Ted Forsyth, Jim Groves, Dave Hale, Terry Jeeves, Lenny Kaye, Ethel Lindsay, Ed Meskys, Chris Miller, Darroll Pardoe, Ella Parker, Norman Shorrock, Rick Sneary. 1. THE ATOM ANTHOLOGY (published by Ella A. Parker 151 Canterbury Road, West Kilburn, London NW 6. @ 7/- or $1) 153 points. 2. ORION (also published by Ella Parker, but @ 1/-. or 15 quaterly) 149 points. 1st place last year. 3. HYPHEN (Walt Willis & Ian McAulay, 170 Upper Nowtownards Road, Belfast 4, N. Ireland. 1/- or 15cents. Irregular but frequent) 127 points, 4th last year. 4. BASTION (Eric Bentcliffe, 47 Alldis Street, Great Moor, Stockport, Cheshire & Norman Shorrock, 2 Arnot Way, Higher Bebington, Wirral, Cheshire. 1/6d) 93 points. 5th last year. 5. SKYRACK 85points. 2nd last year. 6. COLONIAL EXCURSION (published by Ron Bennett, 13 West Cliffe Grove, Harrogate, Yorks. @ 7/- or $1). 76 points. 7. SCOTTISHE (Published primarily for OMPA by Ethel Lindsay, Courage House, 6 Langley Avenue, Surbiton, Surrey) 57 points. Unplaced last year. 9. EPITAFF (Eric Bentcliffe @ 7/- or $1). 35 points. Equal tenth at 35 points were LES SPINGE (Dave Hale, 12 Belmont Road, Wollescote, Stourbridge, Worcs. ), THE FAN DIRECTORY (Ron Bennett - 1/6 or 25cents) and VECTOR (The o-o of the BSFA). Runners-up were: Equal 13. SFCoL’s COMBOZINE and VAGARY (22 points); l5. HAVERINGS (19); 16. SMOKE (17); 17. THE, GOON GOES WEST and NORTHLIGHT (13); 19. RETRIBUTION (11); 20. CAMBER and THe LXICON PROGRAMME BOOKLET (10). Congratuations for the 2nd year running to Ella Parker whose CAPress heads the poll, to Arthur Thomson on heading the poll from the viewpoint of material (and what material!l,) and to Ethel Lindsay on the progress made by SCOTTISHE. THE BEST INDIVIDUAL FANZINE FEATURE OF 1961. Top place went to Eddie Jones for his HOW I SEE IT coverage of STARSHIP TROOPERS in BASTION 2. Practically a walk over for THE HARP THAT ONCE OR TWICE by Walt Willis in WARHOON. l. Arthur Thomson (25 points) 2. Eddie Jones (15 points) Virtually a repeat of last year’s voting. NEW WORLDS again topped SCIENCE FANTASY and SCIENCE FICTION ADVENTURES. BASTION 1 took last year’s vote and this year BASTION 2 headed the poll. ALDISS & HEAVEN TOO by Ian McAulay in HYPHEN. 1. Walt Willis (53 points) 4th place last year. 2. John Berry (26 points) 1st last year. 5. George Locke (14) 2nd last year. 6. Ron Bennett (13) 5th last year. 8. Ella Parker (11) 9th last year. 9. Ian McAulay and Mal Ashworth (8) Ashworth 5th last year. The overall quality of Irish Fandom obviously speaks for itself. It is very pleasing to see Walt sweep to his decisive victory in this, his “Tenth Anniversary” year, and all credit to Ian McAulay for his productive prodding, not only with Walt but also the entire HYPHEN staff. HAVERINGS 10 (6d from Ethel Lindsay) Tom Schluck introduces Klaus Eylmann and the rest of the zine is given over to fanzine reviews; this is becoming almost an invaluable listing through its detailed coverage and regularity. ORION 29 (1/- from Ella Parker who requests that no review be given this issue because of a wish to prune her bulky mailing list). The First part of PARKER’S PEREGRINATIONS, Ella’s Stateside trip report is also out and may be obtajned for $1.50 or 10/-, said sum being the cost of the entire report. Artwork is by Arthur Thomson of course. THE SKYRACK NEWSLITTER by Colin Freeman & Ethel Lindsay was distributed at the con and the same to both of them. VECTOR 14 which continued a goodly article by Bob Parkinson on Hal Clement, more excellent book reviews, a Willis reprint and the long-awaited Kingsley Amis viewpoint (donated by the SFCoL Syndicate which purchased this) on the 1961 LXIcon. Avram Davidson, 410 W 110, New York 25, NY, USA. Keith Freeman, 41 Park Road, Hayling, .Hayling Is., Hants. Alan Rispin, 5 Kingdon Road, London NW 6. - Phone Hampstead 8163. AN ITEM A LINE FROM HERE THERE AND EVERYWHERE: Congratulations to Eric.and Beryl Bentcliffe, married 24th March and to Ian McAulay, recently engaged :::: Archie Mercer changing jobs after 9 years with Malleable. Address still good :::: Congratulations Terry Jeeves, 1st Prize in recent N3F Story Contest ::: What if you want to complain about Alan Rispin? :::: Geoff Winterman, Cheltenham, absent from con following road accident. Get well, schnell! ::: First 63Con Newsletter in from Ken Slater. Bull Hotel, Peterborough, booked :::: TRIODE artist Tony Glynn to attend ChiCon in Sept :::: Berndt Ruthstrom, Brahegatan 8, Stockholm, interested in gleaning details of all fanzines for checklist project :::: RACKHAMART flier should be with issue ::: Hard luck Dave & Ruth Kyle, who sent greetings for Harrogate Con - arrived a day late :::: George Locke out of army. Returned UK March 27 in time for party welcome by SFCoL :::: Ted Johnstone considering ENCHANTED DUPLICATOR reprint :::: Reports indicate that projected German reprint of ATOM ANTHOLOGY is completely unauthorised :::: Beautiful postcards from Antigua, Virgin Islands and Nevis sent by holidaying Boyd Raeburn :::: For the record 8lb Alan Kimball Shorrock born 26 Feb. Congratulations Alan on the choice of parents :::: Rotary duplicator auction (cash for TAWF, 50 cents a throw being run with 31st May deadhine by Buck Coulson, Rte 3, Wabash, Indiana :::: Ken Cheslin, 18 New Farm Rd, Stourbridge reports agenting Japanese fanzine :::: Moral of typing this 1st May is never set yourself a three day:deadline! LES SPINGE 8 (Dave Hale, 12 Belmont Rd, Wollesote, Stourbridge, Worcs) A neat John Berryarn and some pointless discussion on Eichmann - pointless because protagonists Linwood and Dodd evade the point, namely – why Israel is acting thusly. VOID 28 (Ted White. And Co. British agent now Arthur Thomson) Following the poor (in my opinion, Rolf) No 27, this one stands out a mile as possibly the best issue to date. Beautifully reproduced and containing much Grade A material. DIRECTORY OF 1961 FANDOM. 500 fan addresses. Some copies left. 1/6 or 25cents from Ron Bennett or Bob Pavlat.